There’s a reason so much Tuscan cuisine features olive oil; the oil is incredible!! Olive oil is used to bring out the flavor in tomatoes, the popular black kale or to spice up a delicious bean soup. Herbs and salt are also key ingredients in Tuscan dishes. Always be prepared to be generous with these ingredients when cooking a Tuscan dish. Local ingredients are important in creating a careful balance of flavor and technique. Italians tends to eat foods that are in season. Anything else could produce a tasteless and foreign flavor. For this month’s issue of Old World Flavor we feature a two part recipe. For the first part of our meal we create a Soffritto, an Italian flavor soup or stew starter. I love to use the Soffritto to add flavor and depth to many of my dishes. You can also use it in a simmering sauce or for braising meats. The second part of the recipe is a Tuscan Bean Soup that is both simple and full of flavor. 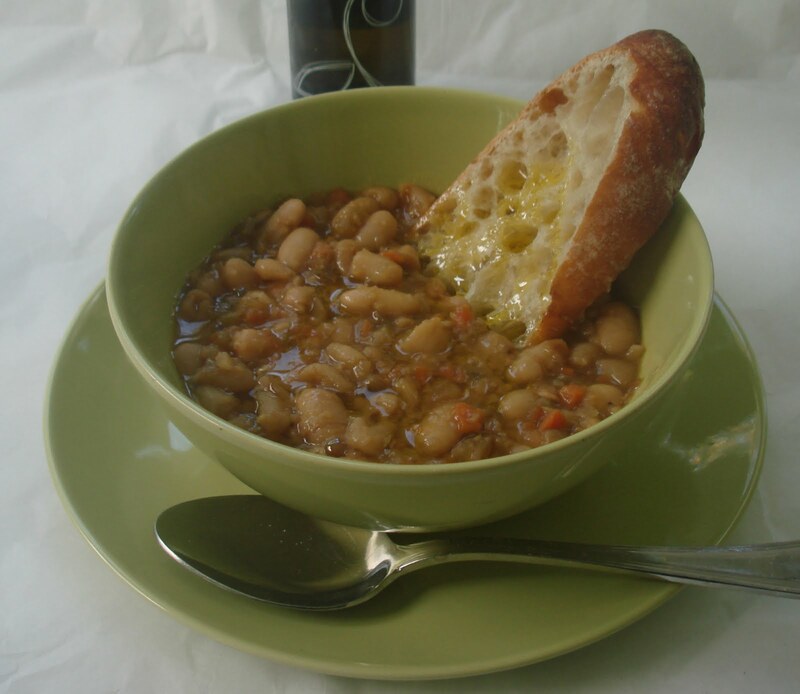 The Tuscan Bean Soup can be eaten as a leftover or frozen to eat at a later date. In fact, bean soups tend to tastes better the day after they are made. My experiences with Soffritto has always been one to emphasize spicy flavors. This one however, focuses on herbs. The rosemary and bay leaf in the Soffritto add both depth and subtlety to our Tuscan Bean Soup recipe that will follow. In a large pan warm the olive oil. Add onions and cook on medium heat for 15 minutes or until the onion are transparent. Next, add the garlic and continue cooking for a few more minutes. Then, add the celery, carrots, rosemary sprig and bay leaves. Continue cooking for 25 minutes until all vegetable are cooked and flavors have blended together. Remove the rosemary and bay leaves before using. Put 1 cup of the Soffritto aside to use with the Tuscan Bean Soup recipe. Store the rest in the refrigerator or freezer for future use. I love to drizzle our Frantoio Extra-Virgin Olive Oil for my bean soups. It has a peppery and fruity flavor that is emblematic to cuisine in Tuscany. This recipe will bring out the best in you olive oil. Tuscans are known for using beans in their meals. Beans, legumes and grains can be dried and stored from the summer quite easily and therefore are used very frequently in the colder season when little else grows. Tuscan soups tend to be a bit thick. They are eaten with a drizzle of the best olive oil available and a piece of bread that can be used as an edible spoon or broken into the soup for an even thicker consistency. Be sure to soak the beans the night before when deciding to make this dish. Herbs also play a major role in Tuscan cuisine. They provide an easy way to infuse big flavor to any dish. The longer you leave the rosemary and bay leaf in the Soffritto, the more intense herb flavor you will have in your soup. Cook the beans in water. Be sure to have enough water in the pot so the beans are about two inches below the water line. Bring the beans to a boil and cook on medium to low heat for 45 minutes. When the beans are almost done, braise the meat in a large pan for a few minutes using a couple of tablespoon of the Soffritto. Then add the beans to the pan. Add the chicken stock and the remaining Soffritto. Add the salt. Bring to a boil and simmer for 45 minutes until the soups had become well blended and the flavors have been absorbed. For a creamier texture, mash some of the beans with a wooden. Serve in a soup bowl and don’t forget to drizzles a generous amount of olive oil on top before eating. For a vegetarian version, leave out meat all together.